Take a bowl with wooden spoon. Stir yeast with milk and water to dissolve in the bowl. Add yeast-water mixture, oil, Bigain the bowl. Mix until no lumps are found. Take a standup mixer fitted with the paddle attachment. Add flour and salt with biga mixture prepared previously. Knead on low speed for 2 minutes. Increase to next speed up, kneading for 3 minutes. Slap the dough with your hand in the bowl, until it feels stretchy and springs back (it will be too sticky to knead on a work surface). Place dough into an oiled bowl. Keep the bowl in a draft-free, warm area to rise for about 90 minutes. The dough should have lots of big air bubbles visible, when ready. Turn dough out onto a lightly floured work surface. Stretch and pull the flexible dough into a rectangle about 20 inches by 8 inches. Cut dough in half (so that each piece is about 10-x-4-inches). Place each dough piece on 2 parchment-lined baking trays sprinkled with cornmeal. Cover loaves gently with a slightly damp tea towel. Let the dough rise for another 90 minutes. Place a baking tray upside down in oven to heat. Remove hot tray from oven, and slide parchment with bread onto hot tray and return to oven quickly. Spray tops of loaves with a little water, close oven quickly. Bake for 20 to 25 minutes, spraying again with water after 10 minutes. Remove bread from baking tray. Cool the Ciabatta on wire racks, before slicing. 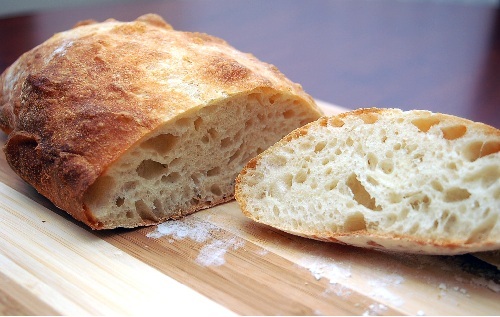 Ciabatta is ready to be served.